The trial for Michael Sykes, who's accused of murdering his girlfriend and her two daughters inside a hotel room, started on Tuesday, Oct. 10, 2017. STATEN ISLAND — A man stabbed his girlfriend and her three daughters more than 130 times inside a hotel because he was jealous over texts she got from another man, prosecutors said Tuesday during opening argument at his trial. Michael Sykes, 26, is on trial for killing Rebecca Cutler, 26, Ziana Cutler, 1, and their 4-month-old daughter, Mayiah Sykes inside the Ramada Inn at 535 Gannon Ave. N. on Feb. 10, 2016. He stabbed Cutler's daughter, Miracle, who was 2 at the time, about 11 times, but the girl survived, prosecutors said. Before the attack, Sykes had been stewing in a jealous rage for days over texts he read from another man on Cutler's phone that lead him to stab her more than 60 times, prosecutors said. "Each stab wound is an expression of rage," said Assistant District Attorney Ann Thompson in court. "Each one is telling you he intended to kill four people." Thompson said Sykes visited two friends days before the murder telling them he was worried Cutler was cheating on him and swiped a kitchen knife from one apartment, which he later used to stab her. Sykes was also caught on surveillance camera the day before the murder hitting Cutler on the street until a good Samaritan stepped in and called the police, Thompson said. 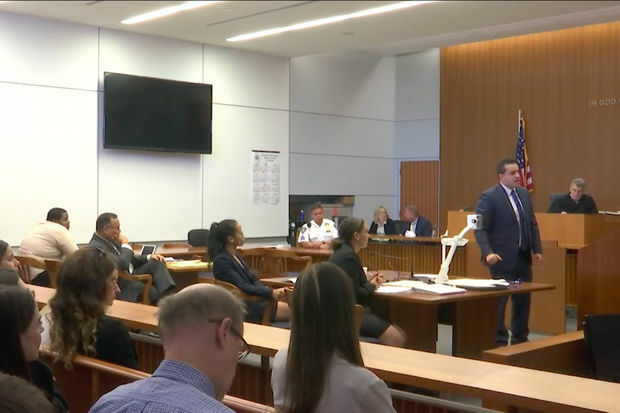 His lawyers, Mark Fonte and Anthony Katchen, argued that Sykes "did not do this evil thing" and tried to paint his relationship with Cutler as one with constant fighting with violence by both partners. While Sykes confessed to police he stabbed Cutler, he told them it was in self-defense after she first sliced him with a knife, the Staten Island Advance previously reported. Sykes' friend told the jury that he repeatedly told the defendant to break-up with Cutler because of their constant fighting. However, Cutler's younger sister, Anjeny Cutler, testified that the only time one of their fights turned physical growing up was because Anjeny lunged at her first. Cutler's family came to court Tuesday wearing pink with photos of her on buttons and T-shirts. "She loved her kids," said Erika Holden, Cutler's cousin. "Everywhere she went, they went." Cutler had been living at the Ramada Inn as part of a program to use commercial hotels to house homeless people, police said. Cutler, Ziana and Mayiah died at nearby hospitals and Miracle was released weeks later from Richmond University Medical Center. Sykes called his mom and confessed to the killings after leaving the scene, telling her that he was going to kill himself, police said. He then visited two friends' homes and spent most of the afternoon smoking weed and playing video games, Thompson said. He was arrested in Queens after a four-day manhunt, police said. Sykes was hit with a 14-count indictment for the murders on Feb. 29, but pleaded not guilty to the charges. Mayor Bill de Blasio pledged to phase out the use of commercial hotels as homeless shelters after the murder, however the practice started at even more hotels in Williamsburg, Sunnyside and Kew Gardens in recent weeks.